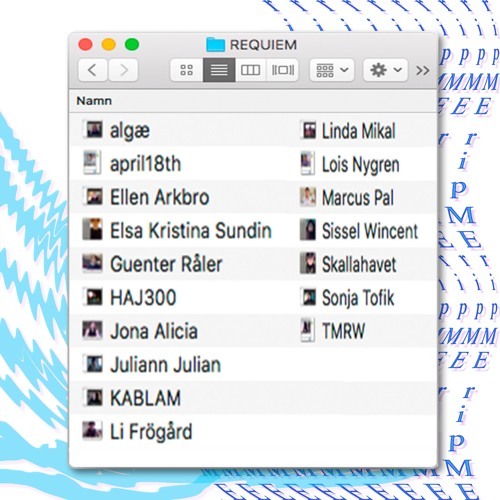 Requiem is a collaborative by rip ME (audio, @restinpeace_me) and Madeleine Andersson (video) incorporating material from 17 artists, released on USB and as a digital album available on Bandcamp. Get it here: https://stoscha.bandcamp.com/album/requiem Video: https://www.youtube.com/watch?v=40qyFy4iFZA&feature=youtu.be The USB release is organized in a system of folders, with one folder containing the musical contributions with an encouragement for others to make their own versions of the piece. The collaborators are: algæ, april18th, Ellen Arkbro, Elsa Kristina Sundin, Guenter Råler, HAJ300, Jona Alicia, Juliann Julian, KABLAM, Li Frögård, Linda Mikal, Lois Nygren, Marcus Pal, Sissel Wincent, Skallahavet, Sonja Tofik, TMRW. Mastering was done by Andreas Tilliander.